Since my last post, in which I was kicking and screaming and moaning, I’m pleased to report that now… I am not. I’m finding a certain exquisite beauty in the dark. It’s fascinating, this observing of myself as I swim around, upended by loss and grieving — not just the physical death of people I love — but other, psychic deaths. Letting go of seasons of my life, letting go of the life I thought I was creating for myself, letting go of expectation, dreams, ambition. So stripped of those things, what’s left? Does that frighten you? To think that there is a place as dark as this, where we are brought to our knees to contemplate our bare selves? I suppose it’s optional. You don’t have to sign up for that program. Really. I’m a little fuzzy about the exact moment when I myself placed the order for this much suffering. It might have been that time beginning years back when I started asking perilous questions like, who am I? And what am I doing here? But if you just can’t help yourself, perhaps it will bring you comfort to hear that after being stripped of those things, I discovered that I am not those expectations and dreams after all. And even having been stripped of ambition, it turns out, I can still get up in the morning and make a bowl of oatmeal. And breathe. It may not seem like so much to you, especially if there is still some unachieved goal you are driving toward. But for me, this experience is profound… it’s like crawling into a womb, a naked, barely alive thing. In the womb I was not my resumé, or my roles, or even my dreams and ambitions. In the womb, I was no more than a pulsing heart and a breath, quite cozy and content to stay in the safety of this darkness, accepting of this world just as it is. And held. And that’s what I’m discovering in this state of darkness as well. 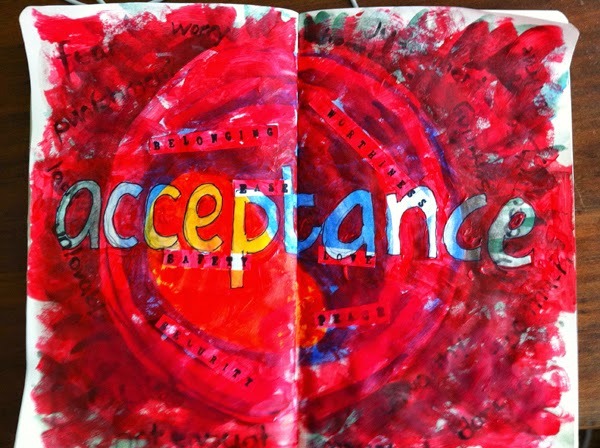 Acceptance — of myself as I am, of the conditions of the world as they are. Just breathing.